California Lung Associates is a private medical practice located in downtown Los Angeles, CA. The practice focuses on the diagnosis and treatment of pulmonary and respiratory diseases and conditions. Our team of board-certified pulmonary and critical care physicians are dedicated to providing the best care and treatment for the most prevalent pulmonary and respiratory conditions that are affecting patients in the downtown Los Angeles and surrounding area. The medical team at California Lung Associates includes Sucha Kim, M.D., FCCP; Bernard S. Kim, M.D., FCCP; Joshua L. Rice, M.D., FCCP; Andrew J. Fishmann, M.D., FCCP, FACP, SFHM; and Olivia Wu, MSN, NP-C. Our physicians are experts in diagnosing, treating, and managing asthma and COPD. Other diseases that we are experts at evaluating and treating are pulmonary hypertension, bronchitis, emphysema, pulmonary embolism, and interstitial lung disease. These diseases although, less common, are often not properly diagnosed and frequently get missed. California Lung Associates physicians know how to screen for and evaluate them thoroughly. In addition to our pulmonary specialty, our physicians provide hospitalist services to renowned orthopedic and spine surgeons in the Los Angeles area. As a hospitalist, we collaborate with these surgeons to ensure that you have the best outcome for your surgery. We are relied upon to medically manage patients throughout their surgery stay at the hospital. This encompasses performing a pre-operative consulation to make sure a patient is healthy for surgery and then providing post-operative care until a patient is discharged from the hospital. Our practice is also conveniently located next to Good Samaritan Hospital. Currently, our physicians provide services at the following hospitals: Good Samaritan Hospital and California Hospital Medical Center in downtown Los Angeles and Saint John’s Health Center in Santa Monica. We are your Downtown LA doctors to help you with your asthma and COPD! 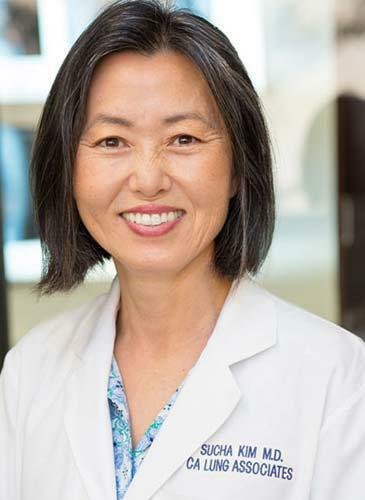 Dr. Sucha Kim is a senior partner at California Lung Associates. Dr. Kim graduated from the University of Kansas, Medical Center in Kansas City, Kansas in 1987. She completed her Pulmonary and Critical Care Fellowship at the University of Michigan Medical Center, Ann Arbor in 1993. After training, Dr. Kim spent a year working as an ER physician before joining California Lung Associates in 1995. She has been providing pulmonary, critical care and Hospitalist care to patients in the Los Angeles area and around the world for over 20 years, including specialized treatment for lung cancer, emphysema, pulmonary hypertension, interstitial lung disease, and COPD. Over the years, Dr. Kim has volunteered as a hospitalist for Operation Walk. She is currently the Director of the Respiratory Department at Good Samaritan Hospital. When Dr. Kim is not working, she enjoys cooking for others, hiking, and being a shutterbug when traveling to all parts of the world. Dr. Bernard Kim is a senior partner at California Lung Associates. Dr. Kim graduated from Tufts University, School of Medicine in Boston, Massachusetts in 2002. He completed his Pulmonary and Critical Care Fellowship at The University of Maryland Medical Center, in Baltimore Maryland in 2009. 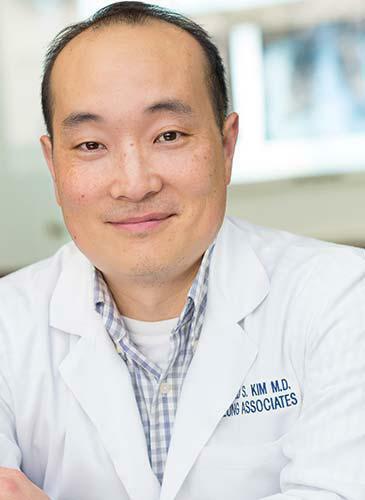 Upon completion of his training, Dr. Kim headed west with his family to join California Lung Associates in 2009. Dr. Kim has been providing pulmonary, critical care, and hospitalist care to patients in the Los Angeles area for the past 7 years. He is currently the co-director of the Respiratory department at Good Samaritan Hospital. Dr. Kim enjoys cycling, training for marathons, and triathlons, being a dad to his two boys, and keeping our staff entertained with movie trivia. Dr. Joshua Rice is a physician at California Lung Associates. He has been providing pulmonary, critical care, and hospitalist care to patients on both the East Coast and West Coast for the past 15 years. Dr. Rice graduated from The Ohio State University College of Medicine in Columbus, Ohio in 1995. He completed his Pulmonary and Critical Care Fellowship at New York Hospital, Cornell University Medical Center, in New York City in 2001. 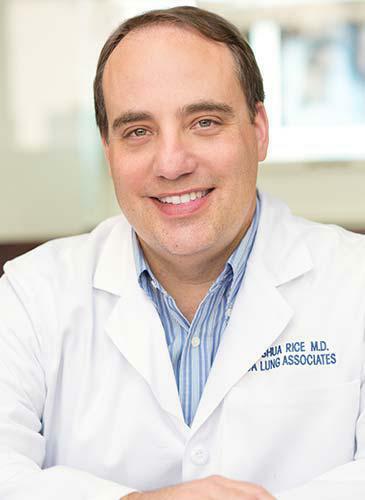 Dr. Rice began his career practicing pulmonary and critical care medicine in Long Island, NY. Upon moving to the Los Angeles area, he joined California Lung Associates in 2004. After several years he decided to leave California Lung Associates to pursue Intensivist Medicine in 2011. In March of 2016, he rejoined our practice and is more fulfilled being able to practice Pulmonary Medicine and welcomes complex cases. When he is not working, Dr. Rice enjoys daily meditation, fishing, hiking, and spending time with his family. 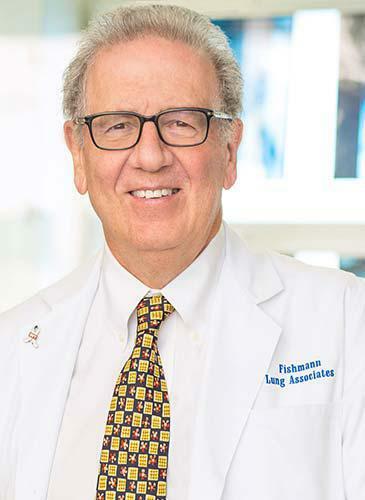 Dr. Andrew Fishmann is our founding senior partner at California Lung Associates. He graduated from Temple University Medical School in Philadelphia, PA, and completed his Pulmonary and Critical Care fellowship at the University of California at San Diego. He has been providing pulmonary, critical care and hospitalist care to patients in the Los Angeles area and around the world for over 30 years. Dr. Fishmann is currently working at California Lung Associates on a part-time basis and is not accepting new patients. He is also the Director of the ICU at Good Samaritan Hospital, Los Angeles. When he is not traveling the world for leisure, or hitting the irons, Dr. Fishmann enjoys volunteering as a hospitalist with Operation Walk, a non-profit organization that provides hip and knee replacements in developing countries. At this time Dr. Fishmann is not taking any appointments for outpatient pulmonary consultations. 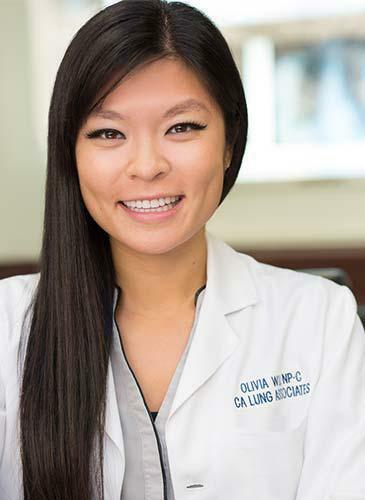 Olivia Wu is a nurse practitioner at California Lung Associates. Olivia attended the Medical College of Georgia and obtained a Bachelor of Science in Nursing in 2008. After working for 5 years and gaining experience in a variety of settings including the ER, ICU, and Primary Care she decided to pursue her Masters. Olivia graduated from Neil Hodgson School of Nursing at Emory University in Atlanta, Georgia in 2013 with a Master of Science in Nursing. After graduating, Olivia ventured west and joined California Lung Associates in 2014. She now works along with our team of physicians at Good Samaritan Hospital. When Olivia isn’t working, she enjoys just about any outdoor activity, but especially hiking and snowboarding, and traveling the world. At California Lung Associates, we contract with the following Medical Groups, IPA's, PPO's and HMO's. Please contact our office to confirm if we accept your insurance provider.